Flachau in winter? Oh YES! Flachau is a well-known skiing area and part of Snow Space Salzburg and Ski Amadé which can easily be reached from Munich, Salzburg or anywhere else via the A10 highway. We visited Flachau in summer 2018 for some hiking, biking and zorbing (Click here to find out what that is! ;-)) and were in love with the mountains, people and activities. There are many winter activities in and around Flachau which include endless slope skiing and snowboarding, fun parks, snowbiking, winter hiking, sledding, horse carriage rides and snowshoe hiking. Happy adventure girls in Flachau! Flachau is part of the so called Snow Space Salzburg and offers access to over 120 kilometres of slopes stretching from St. Johann in Tirol to Wagrain, Kleinarl, Flachauwinkl and Zauchensee! We spend our first day exploring the whole ski resort guided by Max from Sport am Jet. From our hotel it is an easy start, the lift is reached in two minutes on skis and there are many hotels which can be skied in/skied out to. The valleys of Snow Space Salzburg are well connected with different lifts and no long and exhausting flat pistes have to be skied. First ones on the slopes! There is also a great pending gondola called G-LINK which connects the city of Wagrain to the rest of Snow Space Salzurg. Here we have a great breakfast early in the morning in combination with an earlybird skiing start. We are the first ones on the slopes and after the yummy food in the gondola in combination with the fresh snow this “Link to heaven” is just the perfect start into the day and an activity which is really special and we can highly recommend! Max our guide shows us the whole resort and also some secret ski and photo spots. It’s great that the whole resort is equipped with Wifi at ski lifts and huts and it’s easy to quickly share the shots we got at the different photo points. To find reasonable powder patches in and around a ski area is not always easy, but in Flachau there are so many options! 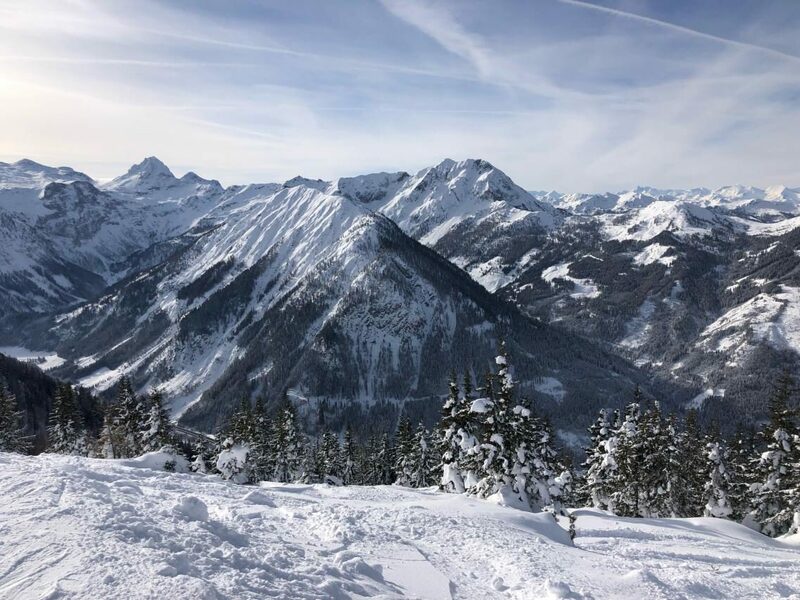 We take different lifts up and find even more runs down – traversing a little from the mountains stations, ending up in superfluffy snow, having untracked slopes and meandering through trees back into the valley – it’s just perfect. After a great day on-piste, a great experience in the G-LINK and another awesome day in the Flachau backcountry we can summarize that there are many reasons to ski here in winter: A great ski resort with perfectly groomed slopes, special experiences and activites and even great off-piste skiing make Flachau an absolutely visit-worthy destination in winter! In friendly cooperation with Salzburger Land Tourism. More information: www.flachau.com – thank you!